CD4+ and CD8+ T cells express high level of CD137 on the cell surface upon activation. A well-documented function of CD137 is its costimulatory effect on both CD4+ and CD8+ T cell growth and differentiation in vitro. In vivo experiments, however, reveal a far more complex effect of CD137 signaling on T cell-mediated immunity. Administration of CD137 agonistic mAb delivers a potent stimulatory signal and leads to CD8 T cell-mediated viral clearance and tumor regression in various models. In sharp contrast, the same agonist mAb is also effective to prevent or even reverse ongoing autoimmune responses, largely mediated through inhibition of CD4+ T cell. In addition to T cells, CD137 is also found on other cells. 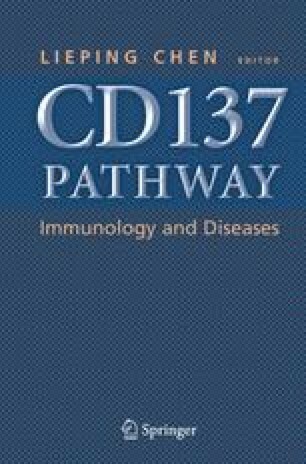 Therefore, the effect of CD137 should be analyzed in the context of regulator of both innate and adoptive immunity in addition to simply be a T cell costimulator.